new drug therapies—laboratory research into the pathophysiological mechanisms underlying this serious disease has led to the development of new and effective targeted therapeutic agents, typified by the ‘biologic drugs’. local audits and local contracts. A number of technologies and strategies for treating RA have received detailed appraisal and assessment by NICE, and many have been found to be both clinically and cost effective for the NHS. So if there has been a revolution in the management of RA, with the expectation of remission, and if the strategies to achieve this are well known and fully approved, why is there a need for a NICE quality standard on this condition? The group met on three occasions to consider evidence-based best practice for the management of RA, with a special focus on NICE Clinical Guideline (CG) 79 on Rheumatoid arthritis: the management of rheumatoid arthritis in adults (see www.nice.org.uk/CG79).9 This process led to the development of seven quality statements (see Table 1). How will the quality standard improve patient care? NICE QS331 was devised to inform best evidence-based practice and commissioning for RA. Importantly, the standard spans both primary and secondary care, since the optimal management of RA requires a successful partnership between the GP, specialist team, and the patient. The quality standard should be considered alongside other policy documents that are relevant to RA (e.g. the musculoskeletal services framework10). People with suspected persistent synovitis affecting the small joints of the hands or feet, or more than one joint, are referred to a rheumatology service within 3 working days of presentation. People with newly diagnosed rheumatoid arthritis are offered short-term glucocorticoids and a combination of disease-modifying anti-rheumatic drugs by a rheumatology service within 6 weeks of referral. People who have active rheumatoid arthritis are offered monthly treatment escalation until the disease is controlled to an agreed low disease activity target. People with rheumatoid arthritis and disease flares or possible drug related side-effects receive advice within 1 working day of contacting the rheumatology service. NICE (2013) QS33. Quality standard for rheumatoid arthritis. Available at: publications.nice.org.uk/quality-standard-for-rheumatoid-arthritis-qs33/list-of-quality-statements Reproduced with permission. comprehensive annual review (statement 7)—annual review is important in performing a holistic assessment of the many different aspects of RA and its associated co-morbidities (e.g. cardiovascular disease, osteoporosis) in order to improve health. Although the standards in NICE QS331 are certainly achievable, there is no doubt that they will present a challenge from many angles, in both primary and secondary care. First, there is the onus on GPs to refer patients with suspected RA to specialist services very early on, as soon as 3 working days after consideration of RA (or earlier). Equally, there will be pressure on rheumatology services to review, definitively diagnose, and institute appropriate therapy for patients within 6 weeks of referral. Whilst most hospitals have multidisciplinary team rheumatology units, not all will have the full complement of clinicians required. Having to respond promptly to patients’ queries, ensure rapid access to services, appropriate education, and a yearly review, may challenge even well-staffed units, prompting a reorganisation of priorities. However challenging it may be to meet the requirements of NICE QS33, it must be remembered that the quality standard is evidence-based, will deliver cost effectiveness, and will clearly bring benefits to patients, who will receive optimal quality of care for what would otherwise continue to be a miserable, costly, and potentially disabling condition. NICE website. Rheumatoid arthritis. Quality standard 33. www.nice.org.uk/qs33 (acccessed 16 July 2013). van Nies J, Krabben A, Schoones J et al. What is the evidence for the presence of a therapeutic window of opportunity in rheumatoid arthritis? A systematic literature review. Ann Rheum Dis 2013; Apr 9 [Epub ahead of print]. Gülfe A, Kristensen L, Geborek P. Six and 12 weeks treatment response predicts continuation of tumor necrosis factor blockade in rheumatoid arthritis: an observational cohort study from southern Sweden. 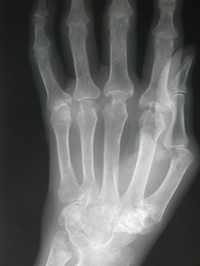 J Rheumatol 2009; 36 (3): 517–521. Legislation.gov.uk website. Health and Social Care Act 2012, s 2. Available at: www.legislation.gov.uk/ukpga/2012/7/contents/enacted (accessed 16 July 2013).